Most Reverend Joseph Osei-Bonsu, Bishop of Konongo-Mampong and President of Ghana Catholic Bishops’ Conference. Catholic Bishops of Ghana have called on government to, as a matter of urgency, abolish surface mining in the country because of the devastating effects mining activities are having on the people. Out of the 14 or more multi-national mining companies in the country, it only AngloGold Ashanti, Obuasi Mine which is engaged in underground mining as the rest are into hot surface mining sometimes in forest reserves, which environmental experts say, is contributing to the rapid depletion of Ghana’s forest cover. Interestingly, these multi-national mining companies would never be allowed to engage in surface mining in their parent countries and environmental advocates believe that these companies are taking advantage of what they call “relaxed mining laws” in Ghana to do their operations. 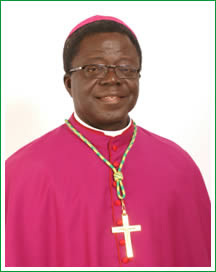 The communiqué, signed by Most Reverend Joseph Osei-Bonsu, Bishop of Konongo-Mampong and President of Ghana Catholic Bishops’ Conference, said even though mining has been going on for a long time, the country cannot affirm that the advantages derived from the mining activities are in any way commensurate with their disastrous impact on the natural environment. The Bishops said it is very sad to note that many of rivers in the country including Ankobra, Birim and Pra are no longer potable due to excessive pollution and also attributed the escalation of prices of food items in the country to shortages in agricultural production as a result of poor soil fertility and erratic rainfall patterns due to deforestation. “At present, according to reliable sources, the forest cover of the country is only 1.2 million hectares, down from 8.2 million hectares in 1957. The annual deforestation rate is 65,000 hectares per year and yet there are numerous officially licensed timber companies in addition to the illegal ‘chain saw’ operators still at work in our forests,” they said. Apart from the concerns about the environment, the Bishops also touched on the oil find and the need to ensure national peace and security. They urged the international community to insist on transparent, fair and accountable processes in the exploration and production of the oil as well as the management of revenue for the creation of wealth to enhance the quality of life of all people in the country.